The section perspective made a successful appearance. Let’s hope it stays and maintains quality without forgetting it is not a perfect substitute for an eye level rendering. Giant context plans………. I hope that when your project starts with a world map that it was worth making that drawing compared to the amount of time you spent on it! Trend or result of pedagogy? You decide… I wonder what will be in vogue next year! Here are some photos of this week’s thesis reviews. Rui and Logan of second year MLA, second studio, with a sediment harvesting landscape based urban design catalyst project for the new proposed East of East Bayfront project by the Keating Channel in Toronto. Jeremy and partner, in comprehensive studio of second year M.Arch with the most perspectives of the class; design for community centre of Dufferin Park. Kelsey and partner, second year M.Arch in comprehensive studio. A 1 to 1 solid wood joinery detail as part of their structural exploration (see: Kengo Kuma). Doubles as table stand. And possibly for sale. Kelsey and partner, second year M.Arch in comprehensive studio. A Ceiling/envelope/structure detail model (see: Kengo Kuma). Eli, MLA Thesis candidate. Very interesting and creative project on parametric landscape generation via “app/game/point accumulation” of elements such as grass, trees, benches, on 1x1m grid at TD centre in Toronto. Extension of Mies’ all encompassing grid… Allusions to minecraft… Related to climate… in an app store near you?? Triptych architecture. M.Arch thesis candidate, to the soundtrack of David Lieberman’s prose. Megan, MLA thesis candidate. Landform building and export via coral farming as a new escape plan for the Maldive islands. Mary, MLA thesis candidate. Three access points into the Georgian Bay as datum to changing water levels. Doug, MLA thesis candidate. Copulation of natural power via terra firma and optimistic design for layover tourism in Reykjavik, Iceland. Conceptual collage. Doug, MLA thesis candidate. Copulation of natural power via terra firma and optimistic design for layover tourism in Reykjavik, Iceland. Geologic section perspectives of the data centre x greenhouse. Doug, MLA thesis candidate. Copulation of natural power via terra firma and optimistic design for layover tourism in Reykjavik, Iceland. Doug is excited about finishing his thesis. Volcanic Rock samples. Doug, MLA thesis candidate. Copulation of natural power via terra firma and optimistic design for layover tourism in Reykjavik, Iceland. I didn’t see this presentation, but the layout was intriguing. From the posted drawings, I deduct this had something to do with poppy farming and opium production in Columbia. M.Arch thesis. I didn’t see this presentation either, but heard it was great. This is a frontal view of the forced perspective section model of the travelling circus. M.Arch thesis. I like the unconventional presentation of panels in this wall-less thesis, but wonder what the significance was..
M.Arch thesis. Material compilation across from the panels. Vinh, MLA thesis candidate. Three interpretive outposts along the Athabasca River. Emilia, MLA thesis candidate. I’m choked this picture is blurry. But Emilia’s thesis was on the post-zoo possibilities of the wild/manufactured landscape conservation Toronto Zoo should it be integrated into Rouge National Park. Emilia, MLA thesis candidate. Synchro in the former polar bear tank? A sketch of Doris Salcedo’s Plegaria Muda on exhibition at MAXXI. One of the most interesting installations I have ever seen: Table upon table with dirt sandwiched inbetween. Real grass growing through the tabletops. In response to death in the artist’s hometown in Colombia. Route: New walk down Via Cavour to the Capitoline Museum on Piazza del Campidoglio, up Via Nazionale past institutional buildings to Bernini/Boromini’s opposing churches and four fountains to find that the Santa Maria della Vittoria was closed :(. To Barberini station to visit MAXXI, then metro home. A fitting quote for a place where so much art is roped to the raft of religion. 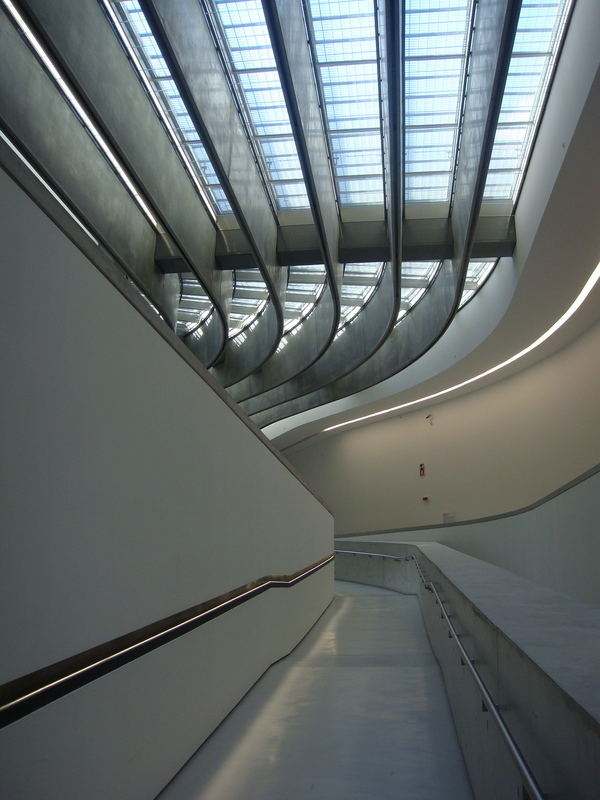 We visited two important art galleries today: the Capitoline Museum atop the Capitoline Hill, and Modern master Zaha Hadid’s MAXXI National Museum of 21st Century Arts. Two drastically different kinds of gallery spaces. Two drastically different kinds of art. 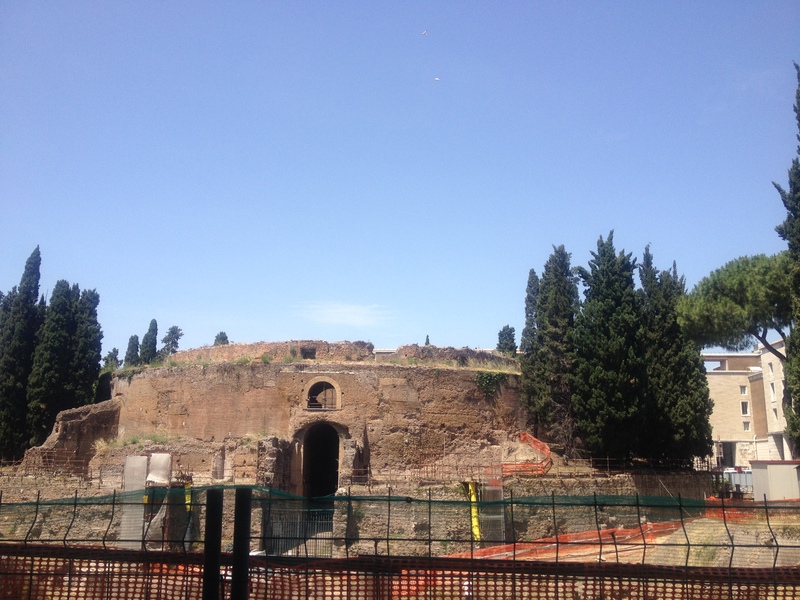 Two different spatial contexts.They are excellent summaries of the principles of old and new Rome that I have been investigating the past ten days. Piazza del Campidoglio, Marco Aurelio centre. 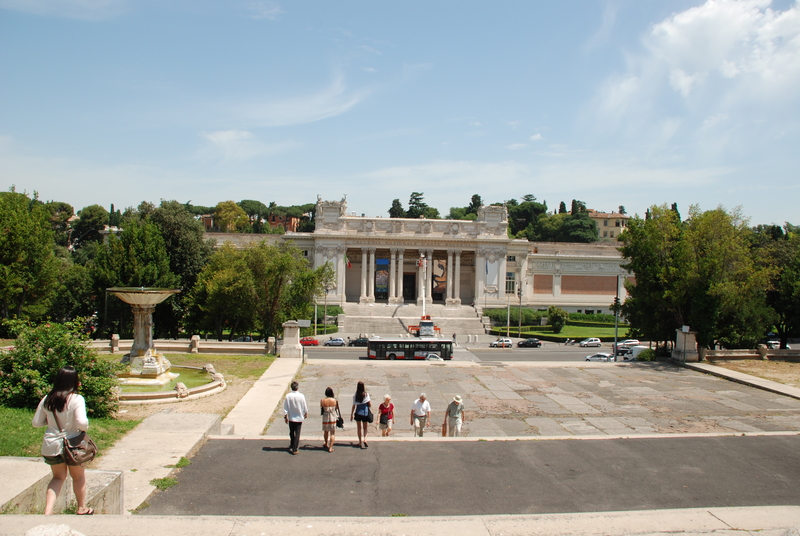 Museo Capitolini is situated at the top of one of Rome’s seven hills, backing onto the ancient forums and fronted by Piazza del Campidoglio. The site is famous for it’s straightening of facades and fitting of the piazza into geometrical star-shaped symmetry by Michelangelo. In the centre of the square (circle?) stands a statue of Marcus Aurelius on horseback in a pose mimicked in all of western Europe by every political figure on a horse. 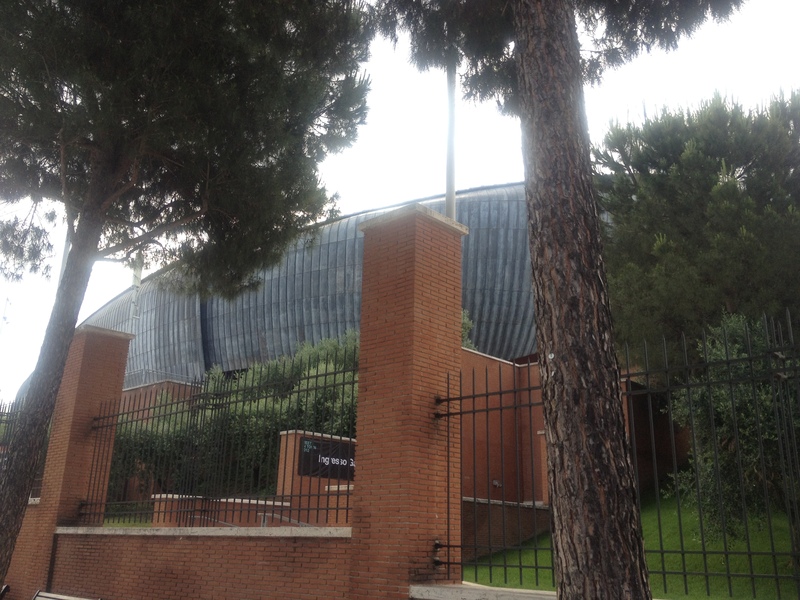 The collections are also Papal, so similar to what we saw in the Vatican Museums. A stunning array of marble sculptures of people with more mythical scenes and evidence of Rome’s pagan past, including a reconstruction of what the Temple to Isis in Santa Maria Sopra Minerva would have looked like using actual artifacts. It offers breathtaking views of the ruins in the Forum, as well as of Rome herself from atop the rooftop cafe terrace. The approach is extremely traditional: a sloped, strampy type of structure called a Cordonata. 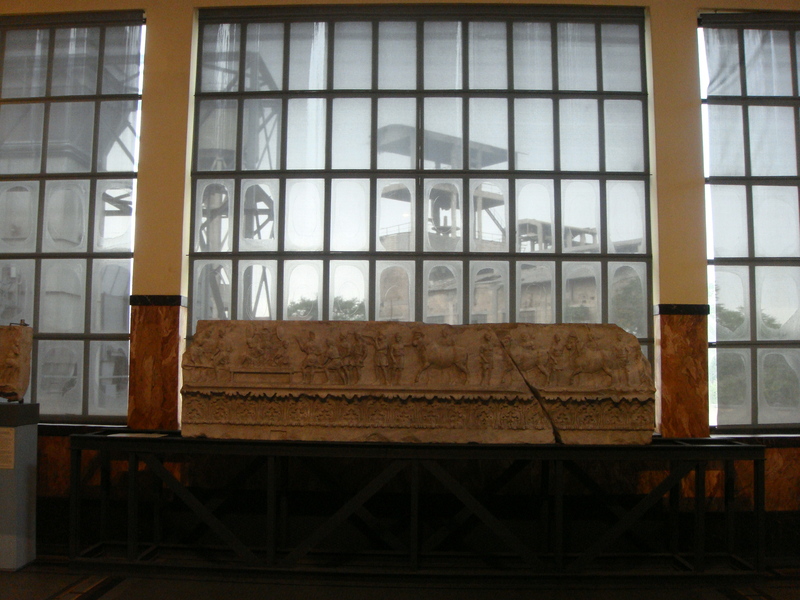 The museum itself is split into three buildings, one of which dips below into the hill to provide views of the Forum and provide passage between the East and West wings. They are each punctuated with outdoor courtyards which held the larger sculptures and allowed for great light to fill the museum. 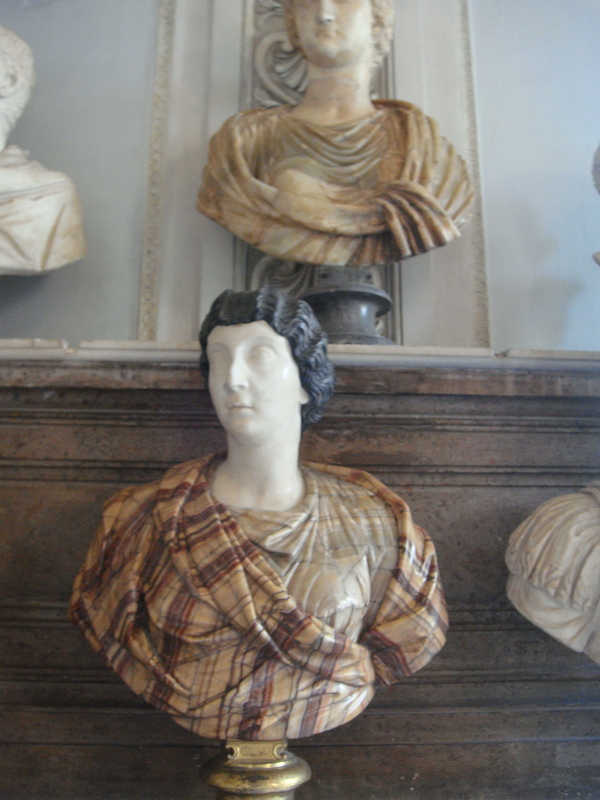 The first time I saw striped marble used as a textile. Extremely skillful. Interestingly, we were not allowed to sketch in this museum, but were allowed to take as many photos as we liked. The plan had no logical flow, at least that I could tell, and we wandered through halls back and forth back and forth, the sculptures all blending into one amorphous white, eyeless head. Another testament to it’s plan: our group split up after the main courtyard and remained scattered for the entire visit. Such is the case with other older buildings restored to have second, third, and tenth purposes. Visible: the wooly mammoth leg, an array of clotheslines carrying childrens’ clothes, the long peekaboo horizontal windows, the strange futuristic silhouette. If I had to use one word to describe Zaha Hadid’s contribution to Roman art, it would be speed. The entire building felt like a grey futurist painting with a streak of red smeared across. MAXXI is sited in the nearest northern suburb of Rome near where the rail tram turns around, so it looks almost like a train station. The approach is through colourful flags, afternoon glow, children running in the plaza shared with a daycare. All approaches are diagonal and unsloped: there is no clear way to say, this is the entrance to the building and you should walk here. The most direct route, which at this point, we were extremely accustomed to looking for and having laid out for us, was across plantings of trees, gaps in concrete slabs, and dangerously trip-hazard low fencing. Oh, and the wooly mammoth leg. 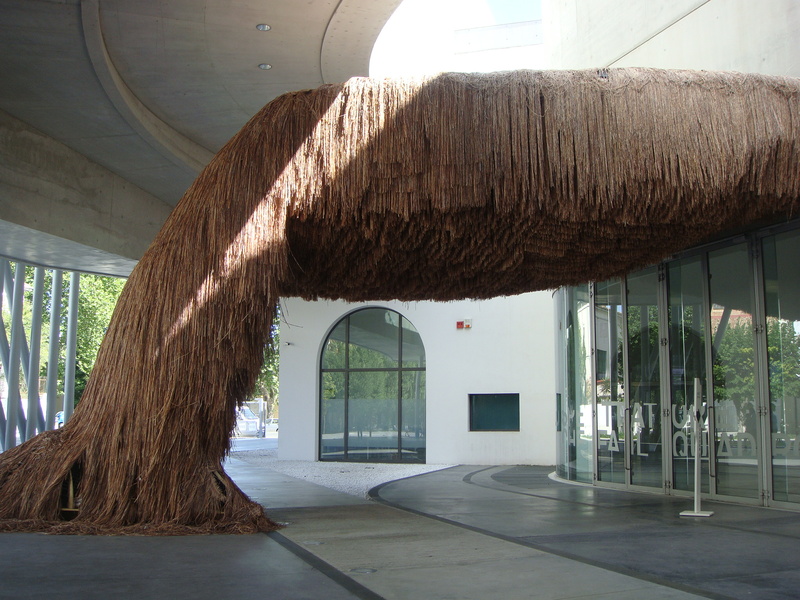 It gained more architectural relevance to us when we found out it was actually supposed to be reminiscent of Brazilian huts, and I actually enjoyed the sound it made in the breeze. Still a wooly mammoth leg though. And still ugly. The building itself felt cold and inhuman, but not in an imposing way like the Vatican or the EUR. In a curious, futuristic way that encouraged you to reach out to touch it. 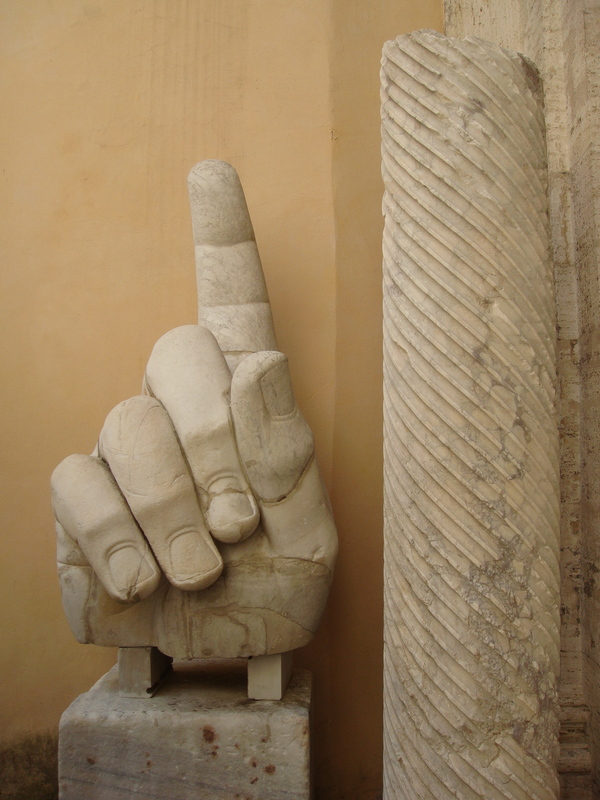 There was so much negative space, especially compared to the wall to wall bust adornments of the Capitoline Museums. We carried out 15 minute sketching exercises in each room but were not allowed to take photos. 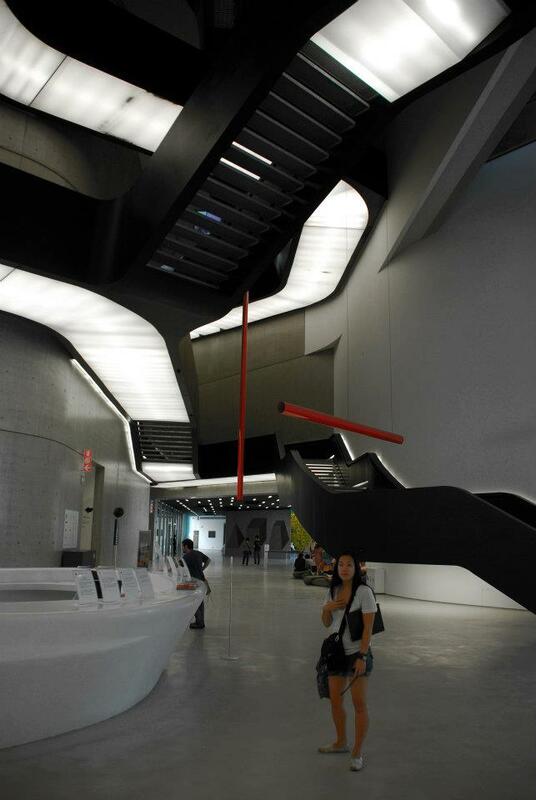 MAXXI reminded me most of the VAG out of ever gallery I visited in Europe, because it was filled with unknown international artists, temporary installations curated on six different coalescing themes, was extremely air conditioned, and had a ridiculously capital A Art bookstore. Architecture that photographs extremely well but feels strange to be in. Route: Metro to EUR, walk halfway then to and from and back ??? church, bus back to Statione Termini, afternoon capo cornetto, delirium, early night. 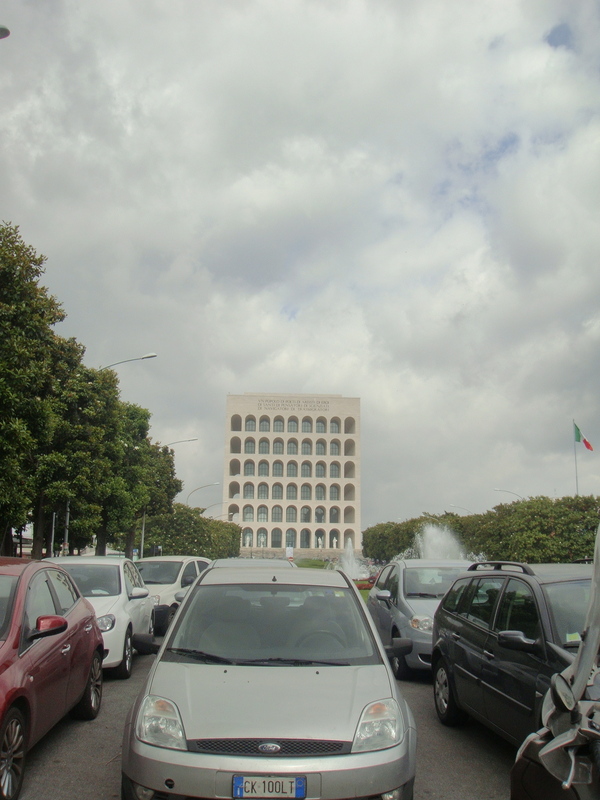 Today we went to the EUR, the business financial district of Rome, and also the most “modern” and car-based culture in Rome. It stands for Esposizione Universale di Roma, which was slated to happen in 1942 to coincide with the 20th anniversary of Fascism in Italy, but never did because of the second World War. Although the buildings in EUR were commissioned to a variety of architects, they ended up looking very much the same. 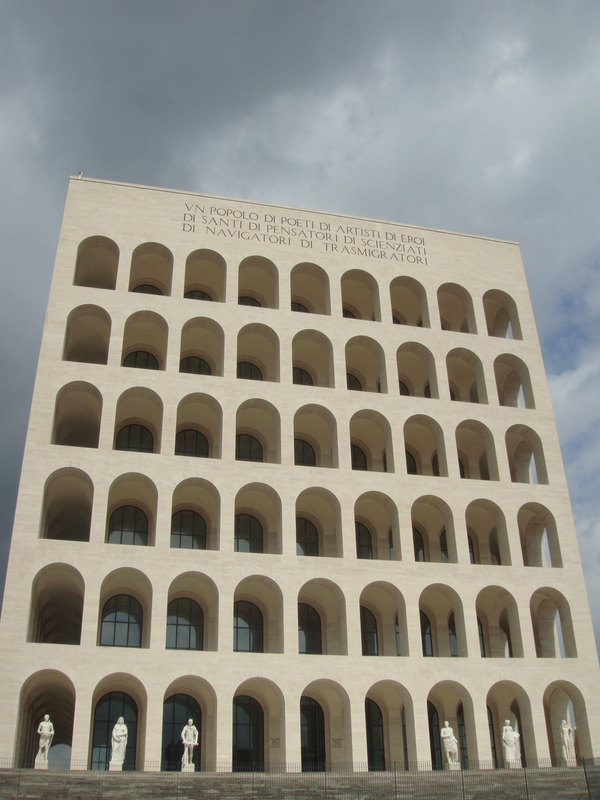 Get ready for a lesson in Fascist Architecture 101.
between aesthetic and meaning. The result is a lost-looking concrete and steel architecture that, when blown out of scale in order to proportion itself to the power of Fascism, was not only void of reference, but of feeling. See Italian surrealist/pittura metafisica artist Giorgio de Chirico for art historical adjacency. Where streams of parked cars form a second river. Where 416 arcaded collonades house a completely empty glass box adorned with statues of men. A nation of poets, of artists, of heroes, of saints, of thinkers, of thinkers, of scientists, of navigators transmigratory. 2. To pass into another body after death. Used of the soul. To assert power and the strength of men in the face of an oncoming storm. Where they named a piazza after JFK to show the strength of principle alliances. To contemplate the heavens staring up at a church you can never reach. Where the streets are named after countries and dead presidents whose presence can only elevate us. The EUR deals with scale in a different way than in Vatican City. While both are completely at an un-human scale, the EUR not only does it with it’s buildings but with it’s approaches. We were warned that walking from one point to the other would appear near but actually be far, but we also experienced this in an accidental way by walking 7 km to the wrong church on a highway. That aside, tiredness, six lane highways, sedans and suits, square columns, and a reading presented by Rosa on memory made me feel more than a bit empty inside. I had a bit of a crisis of faith and identity today. And for this reason, I think this was one of the most interesting days in Rome, because usually people talk about spatial affect only when it refers to beauty: the joy you feel when you walk in an elaborately decorated church or your childhood home. That the EUR can make you feel uncomfortable to the point where you question your own existence is even more powerful. I wasn’t left with a lot of conclusions after today: mostly questions. 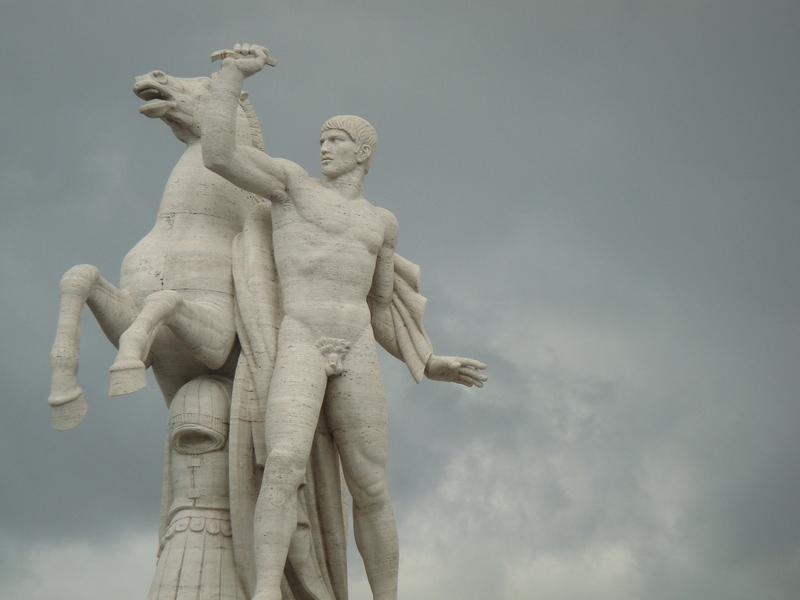 Why did modernism fail, on an international level and specific to Rome? Why did it result in the cars and suburbs and keyholes that we see today? Why do we keep a record of our family histories, do they matter, what what does it mean that I do not exist in my written history? What happens then to people that have never existed in any? Why do we build objects that fail to bring us joy? What use is it to strive together for something beautiful in a world where one terrifying power can end it? What of individual creativity in a world where we are constantly asked to give to others? I took an unopened pinecone from the EUR. It sits on my mantle reminding me that even when all you can see for miles and miles makes you want to shake your head, you look down. There is new life waiting to spring forth, with the scent of gin and the vitality of a hundred year old tree. Distance of scales, Scales of empathy of distrophy weighing. A secular god to a Fascist religion. Where is the Temple to Human Spirit now? That is to stand when we are forgotten. Non-descript among the leaves of our families’ trees. This is why we remember. I will find meaning in everything I do. Route: metro to Statione Flaminio, took the mini tram to see Renzo Piano’s Auditorio de Musica and Zaha Hadid’s MAXXI contemporary art gallery just north of the City Walls. Walked back to Villa Borghese (Rome’s Stanley Park), and visited Galleria d’arte Moderna in the park, Rome’s biggest modern art museum. Walked to Richard Meier’s Ara Pacis memorial to Augustus, gelato and wine in the afternoon shade, shopping in Trastevere, walked along the Tiber back to Piazza Navona for dinner. Tried to get back to Statione Barberini, got us lost. Stumbled upon Trevi Fountain at night. Serendipity. Route: Metro line B to Pyramide, walk along Via Ostiense to Montemartini Art Centre, walk back, Metro line B to Metro line A, Metro line A to Flaminio, walk about Villa Borghese, read for two hours, then walked to Statione Spagna to get home. Friday and Saturday were a study of modernity in the city of ancients, as we visited some starchitecture within and around the city, and I read and summarized a 53 page reading on Modernism in Italy. What follows are my findings from the two journeys. In sum. Romans have long pushed back against modernism because they are proud of their past, and the whole premise of modernism is rejection of the past and it’s associated values. I would also like to speculate that the strong presence of religion has also played a part in slowing the adoption of modernity into the city itself. But the rejection of modernism does not mean a rejection of modernity necessarily. In terms of transportation, conservation, and a history of reuse, Rome is in many ways much more modern and contemporary than most Canadian cities. 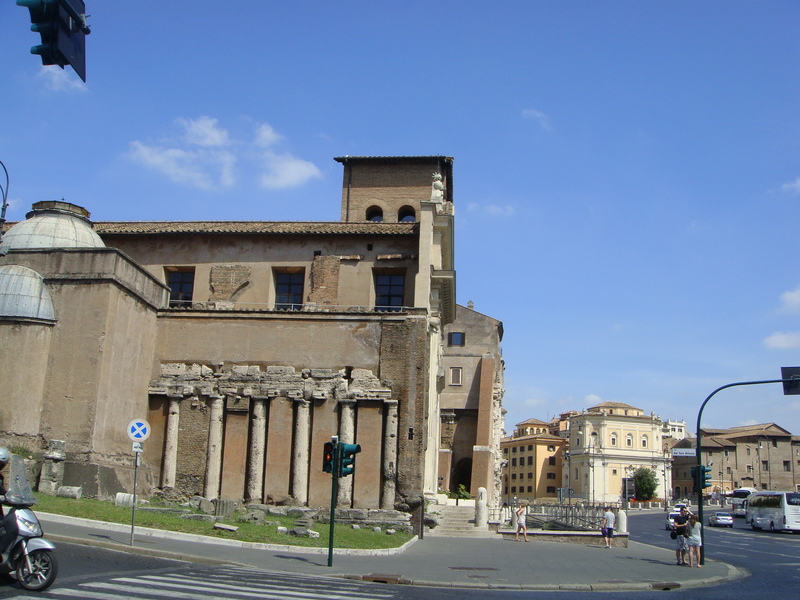 Conservation of buildings and renovation over the building of new has a lot to do with the success of surviving artifacts and preservation of the historical fabric of Rome. 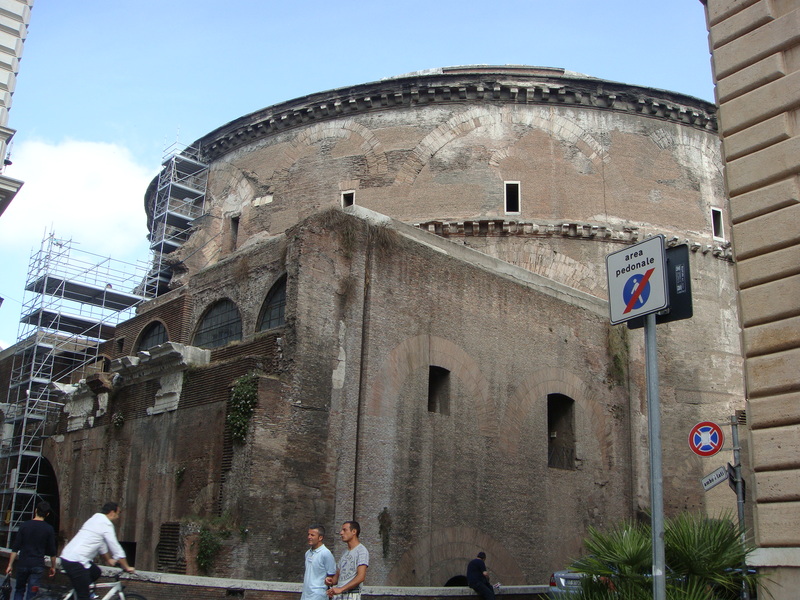 Condominums atop of a 2000 year old theatre (Theatre of Marcellus, see Day 3)! Subsequently, modern architecture has had to work around this surviving fabric, literally at times. During the construction of Renzo Piano’s Auditorium Parco della Musica, ancient ruins were discovered while digging for the foundations; a problem commonly “run into” for new building projects, especially Roman metro lines. 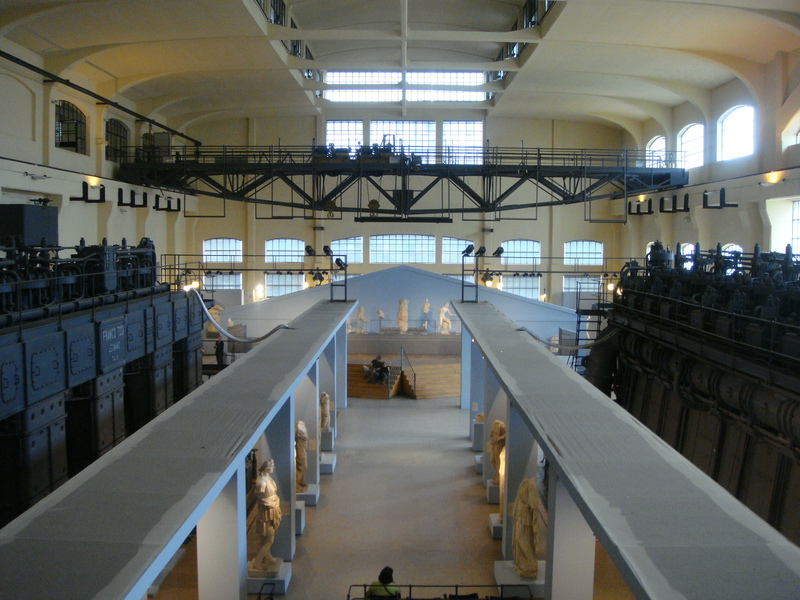 In the case of Piano’s auditorium, they were preserved and turned into a featured dig roped off as part of the buildings themselves. The three buildings also reference the form of ancient outdoor Roman ampitheatres, as they all approach on a large outdoor seating space. MAXXI we visited another day when it was open, but we visited three other galleries over the two days that are excellent examples of the juxtaposition of old and new that are all extremely successful. 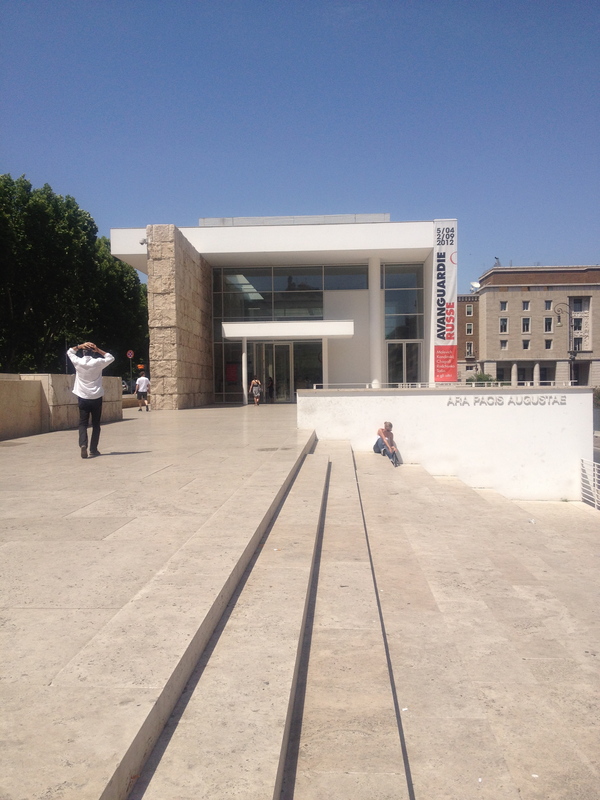 Situated in the middle of old Borghese private property, the National Modern Art Gallery looks nothing like MAXXI, it’s other contemporary. Although it was built in 1911 at the height of modernism, it uses a neoclassical facade that fits in with the look and feel of the rest of the Villa, and is approached by a large descent that equals the ascent, giving it an imposing quality. 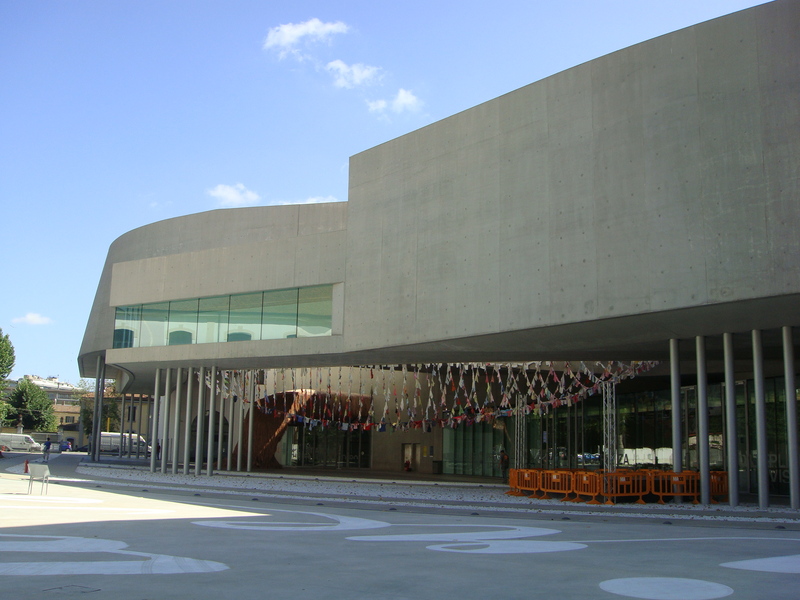 It’s modernistic aspect comes from the most comprehensive collection of Italian modernist art in Italy housed inside. The art itself is worth discussing in the “Modernism” section of these chronicles, because, like the building and other modernist architecture in Italy, it takes on new forms, new materials, and tries to struggle free from the holds of history and antiquity that steep and surround them. 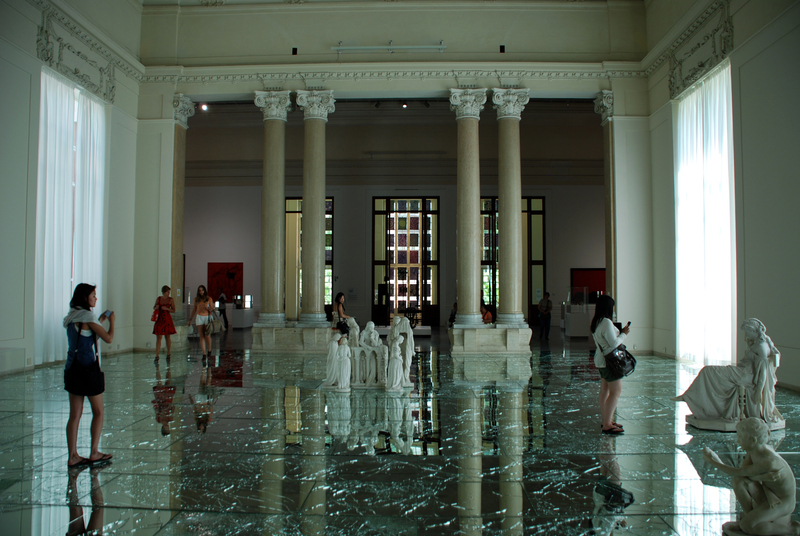 Marble sculptures in the vein of ancient and renaissance classics began to writhe and pull towards Rodin, set in a gallery with a broken mirrored floor. Experimentations with material and scale stand painfully beside the reminder of an arched doorway, rejecting the monochrome abstractions housed behind. Why it works: because of the struggle that Italian modernists faced in both architecture and art, this museum stands as a testament and storehouse of a unique and complicated history. 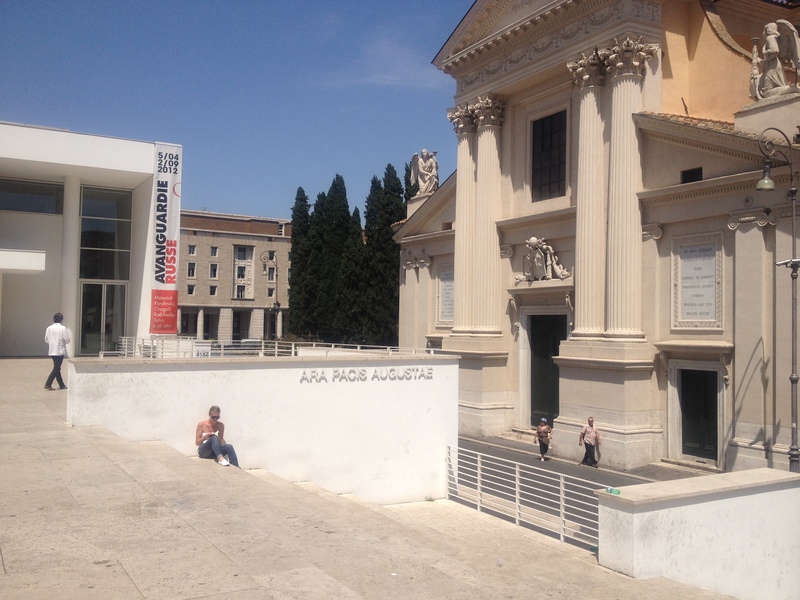 One of my favourite spaces in Rome: Meier’s signature white concrete planes set beside a classical church facade and the ancient rotunda of Augustus’ Memorial. The straight planes were a welcome relief after having spent a week drawing column after column after column. 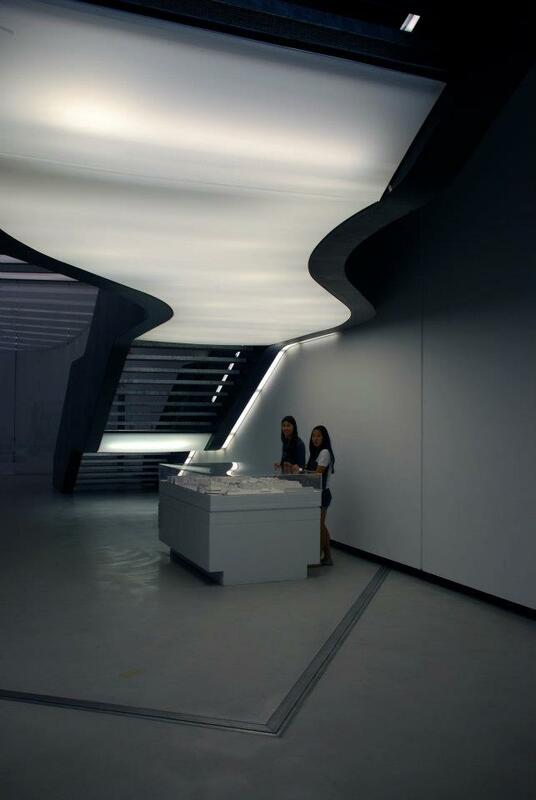 Inside, materiality felt consistent with the monument to peace that it housed, and it was extremely cool. Air conditioning! Ara Pacis refers to the era of peace brought about by Augustus, also known as Emperor Caesar. 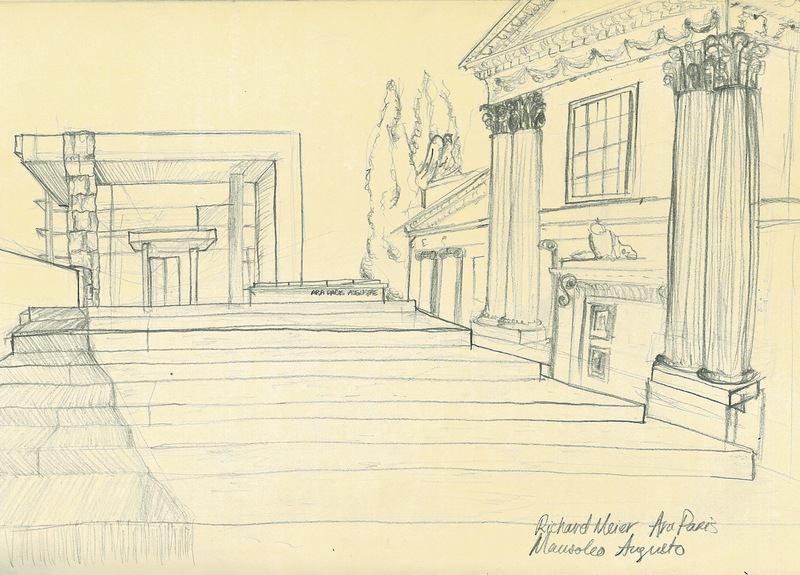 The monument to peace was discovered in the Augustus memorial (the brown rotunda), and placed outside for public visitation before it was determined that deterioration was inevitable and a building must be commissioned nearby to house the artifact. Why it works: because it is a peaceful jewel of modernism that houses a jewel of ancient peace. It is non-confrontational but serenely bold. The colour palette breaks with Rome only insofar as it is white, carte blanche, tabula rasa. Again, located on the outskirts of the city, this time on the South side. Entry #6 in my travel book’s list of “Top Ten Beyond the City Walls” describes “Rome’s very first power station has been transformed into a remarkable showcase for Greek and Roman statues – parts of the Musei Capinolini collection…The effect is extraordinary, playing the monolithic might of modern technology off against the noble, human vulnerability of these ancient masterpieces.” I couldn’t have said it better myself. 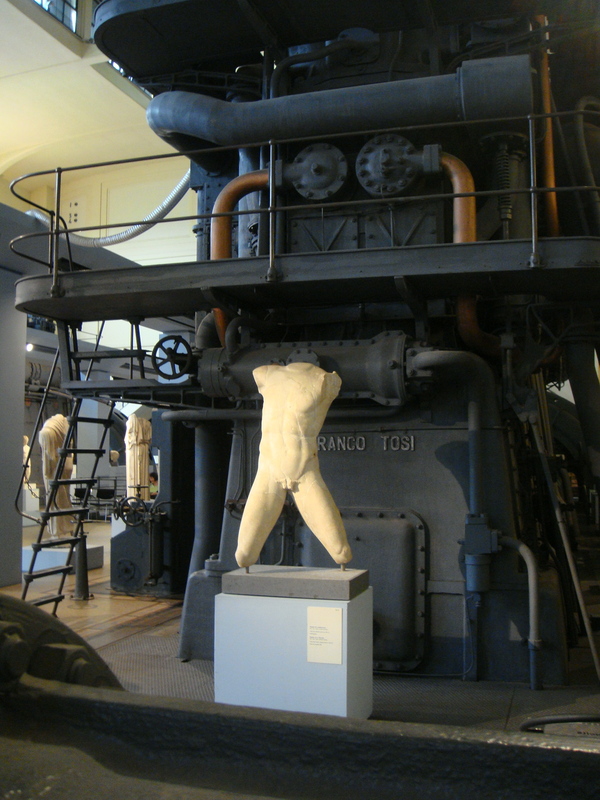 The permanent exhibition, called Le Macchine e Gli Dei or “The Machines and the Gods” tells the narrative of the development of two kinds of power in Roman society: power through art and representation of important figures, and powering a city with resources. Against the stark contrast of black cast iron stand fragments of torsos, limbs, asses, all in white marble, shocked to find themselves surrounded by such heavy industry. Why it works: because it is absolutely beautiful, surreal, and perfectly frozen in time. 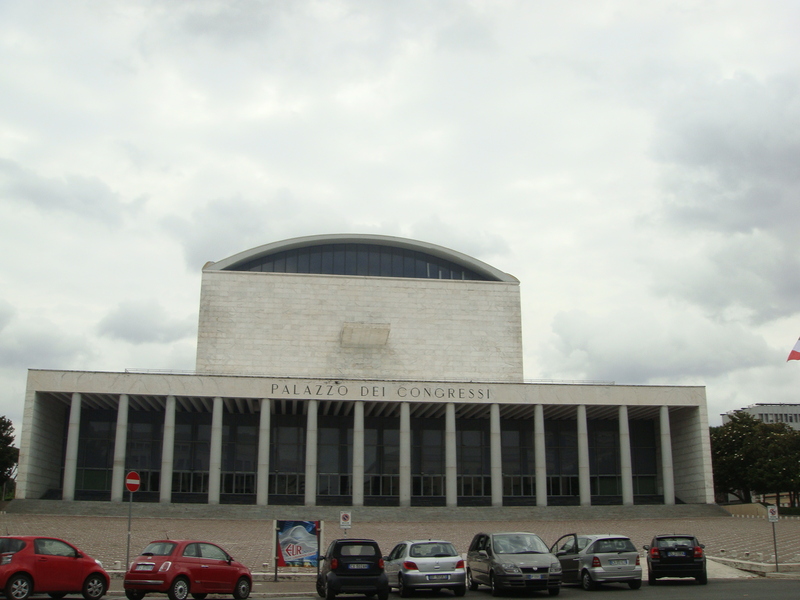 Modernism failed in Italy for two reasons. It was mired by context and did not fit in with the palettes, forms, and shapes of the past. It was taken up by Fascism. 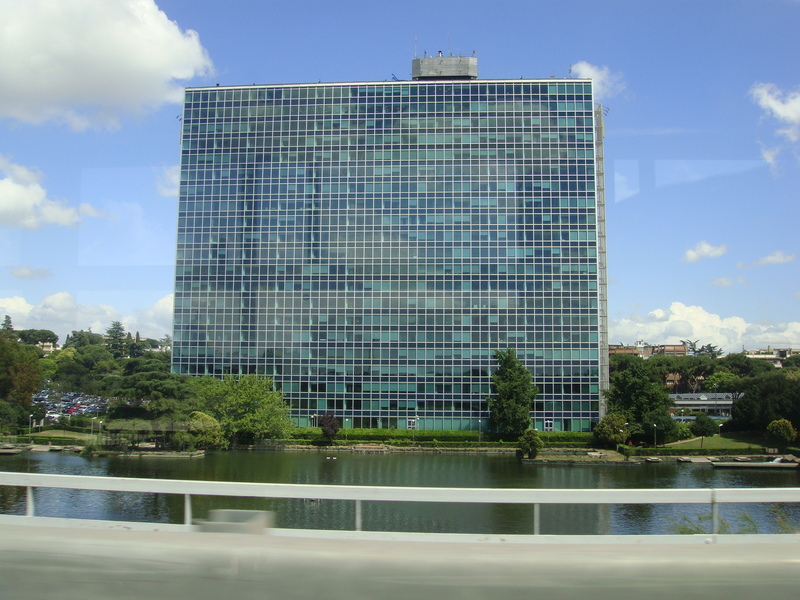 CIAM, the Congres Internationale d’Architecture Moderne formed by Corbusier and co. in the early 20th century, condemned Italian modernism for not breaking with the past. But with a history as strong as the Roman Empire, what reason did Italy have to reject it’s proud past? With the resurgence of powerful leadership under Mussolini, what choice did they have to really have in pursuit of a new world order? 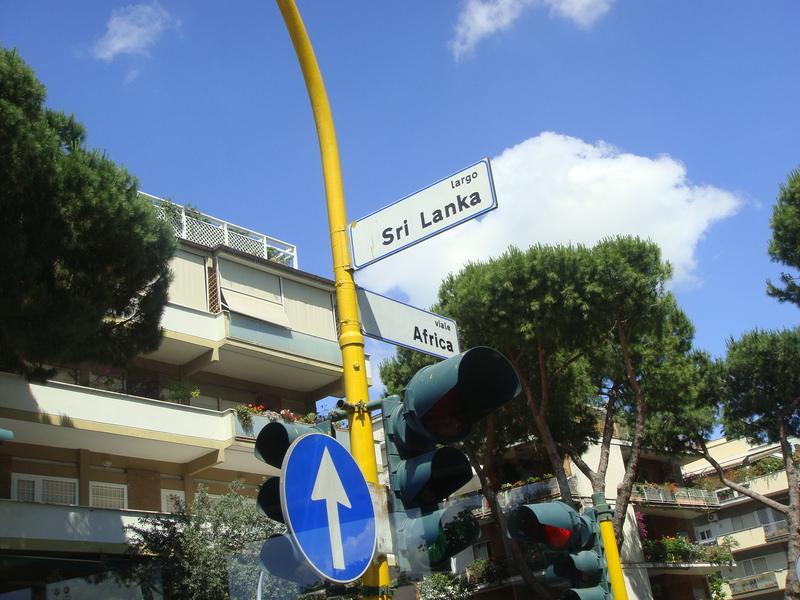 Rome especially found it’s out in the form of “The International Style” and in the proliferation of suburban low-income housing projects that Modernism became so famous for. Even today, commercialism remains the plague of Roman suburbs, leaving the historical centre clean and free from the apparent class divisions that Modernism claimed to want to solve. 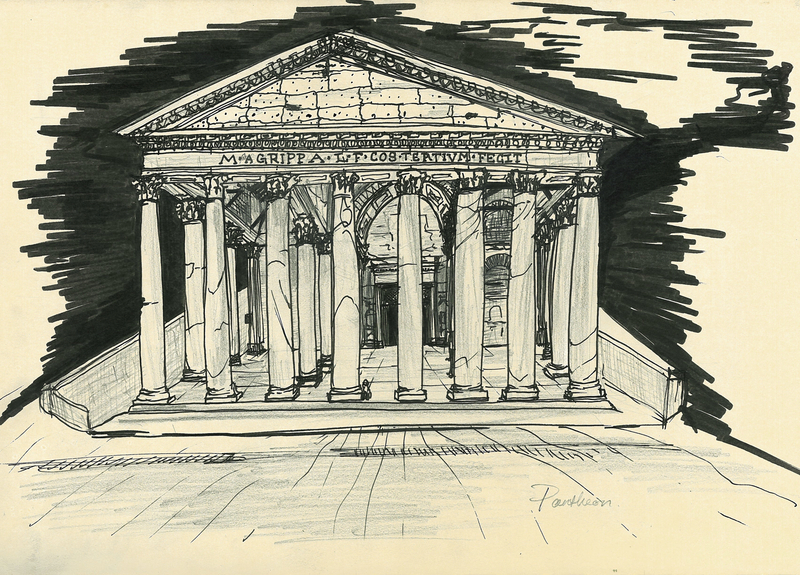 My sketch of the Pantheon. I think I switched perspective points about three times so please forgive the awkwardness.. Still warming up. Route: Santa Maria sopra Minerva (Piazza and Church), Pantheon |(tombs of Raphael and Vittoro Emanuel II, former King of Italy) and Piazza della Rotunda, Area salra Delargo de Argentina, Jewish Synagogue Museum, Temple to Hercules (formerly Vestal temple), Temple of Fortunes, Basilica di Santa Nicola in Carcare, Teatro di Marcello, Basilica di Santa Maria in Cosmedin which holds the Bocca della Verita/Mouth of Truth, Circus Maximus, and later stumbled upon Campo dei Fiore and Piazza Navona on our way back to the Pantheon. Roman Mornings was first published in 1956 by James Lees Milne. 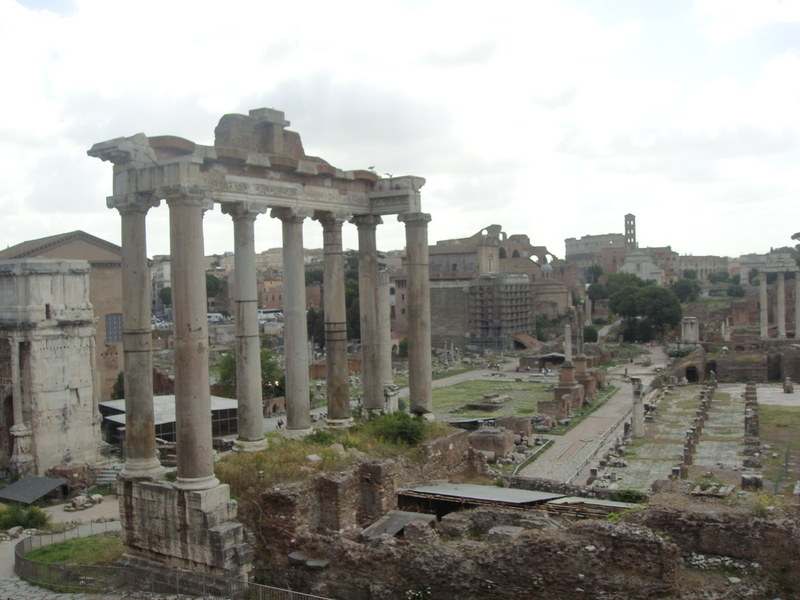 It recounts eight buildings in Rome as examples of certain eras of Roman history. They are mostly churches, and today the most significant historical sites we visited were two of those churches. In the vein of Roman Mornings, day three of Derive a Roma took us on a historical tour of the city, because if one is looking to read into the layered and conflicted history of a deeply religious and powerful empire, look no further than the buildings which house her faith. In studio in January, we did a series of case studies based on the interpretation through lenses of stories, strata, and streets “in such a way as to illuminate the dialectical character of the historical process: one that yields a specific built morphology and a truly unique built entity, and one that is to be found in only one place.” Rome is the perfect place to address through these lenses because it is full of myth, has a visibly layered historical strata, and winding streets that relate directly to papal planning processes. Today, I am interested in strata because it best depicts the multi-layered filo pastry that is Roma’s past. The strata of her churches begin on Pagan foundations overtaken by Christianity, converted from circles to crosses. Being a huge fan of Gothic churches, I was surprised by this fact, and pleased to know that there was at least one, even if it was built on an ancient temple to the Egyptian goddess Isis. 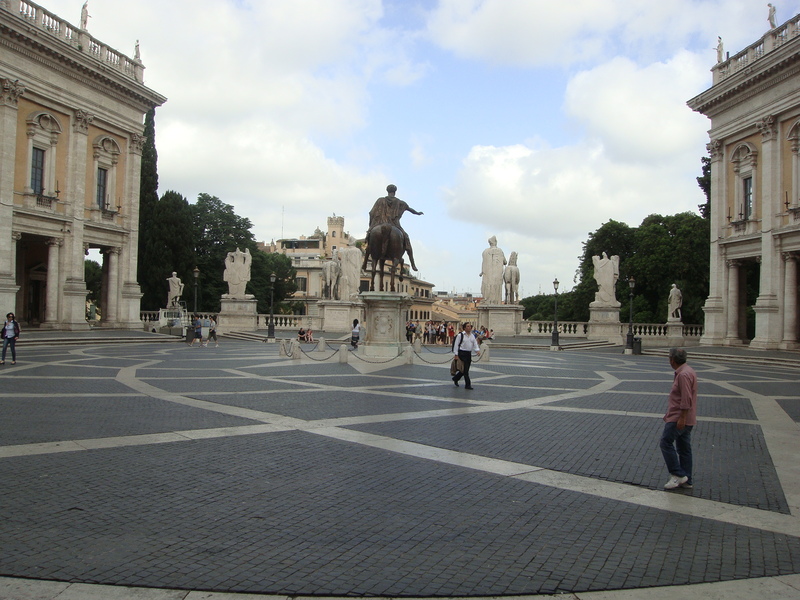 The hint of what lies beneath comes from a Bernini obelisk in the adjacent piazza. 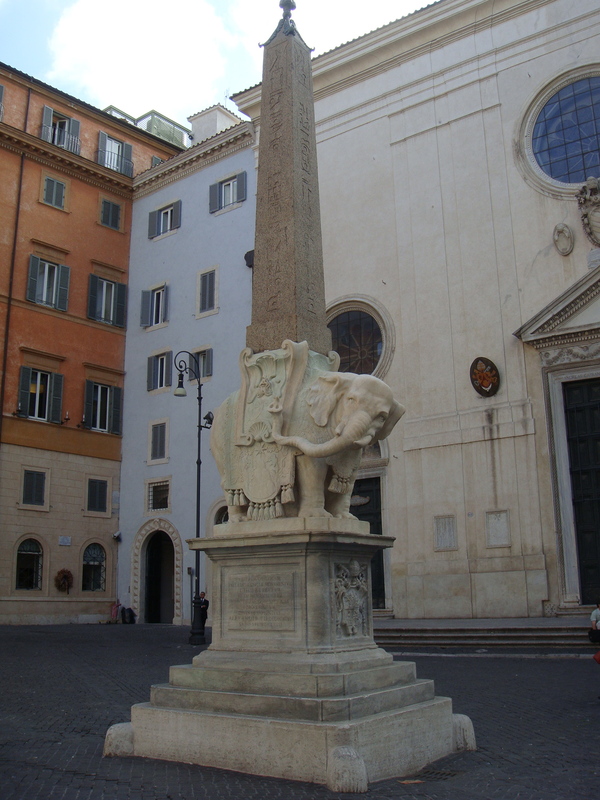 The obelisk is carried by an elephant, seemingly happy to have found itself by the Pantheon on it’s way from Africa to the North Pole. Bernini’s Obelisk outside the Santa Maria Sopra Minerva’s unassuming facade. Two other churches we visited today explain Less-Milne’s point very well: Basilica di Santa Maria in Cosmedin and Basilica Santa Maria Nicola in Carcare. Situated about a block apart from each other and separated by two carefully preserved ancient pagan temples, Carcare was also built on pagan foundations, and Cosmedin was “not truly Roman, Lombard, or Byzantine, but a protracted evolution of all three styles.” Caught in the transformation of a great empire between two religions, the churches illustrate a careful set of decisions to preserve and conserve specific pieces and versions of history, including remains, materials, and art. Santa Maria in Carcare. Note the columns and porticoes still evident from the previous church. 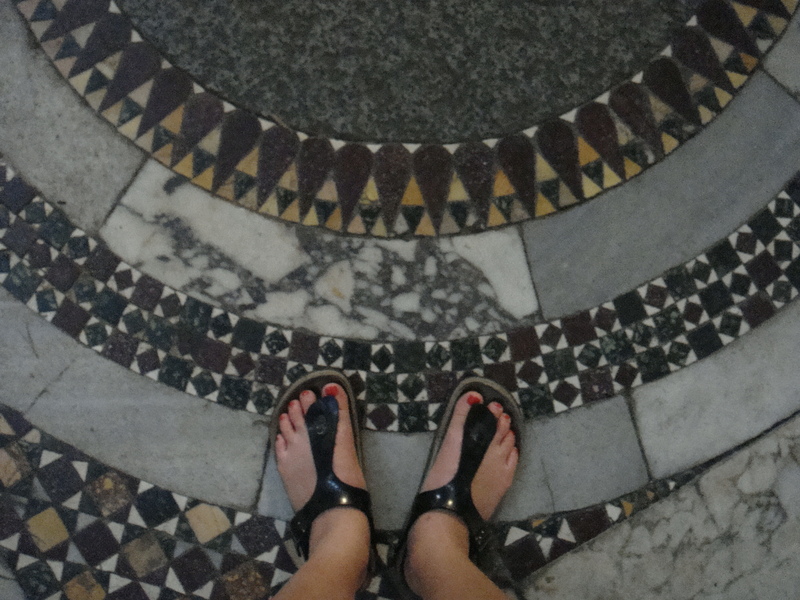 The beautiful mosaics in the Santa Maria in Cosmedin. 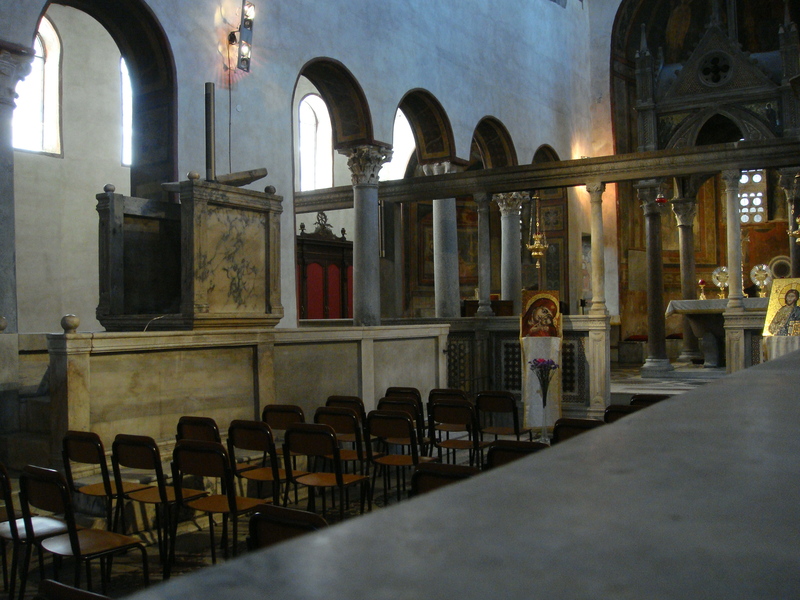 Interior shot of the Santa Maria in Cosmedin taken over the choral barrier. The wall used to separate those worthy of witnessing a worship from the common people and women during mass, which was usually given in latin, a language they did not understand. The structure mimics that of a cube, as it stands 140 ft. tall and 142 ft. in diameter. It can fit a perfect sphere inside. 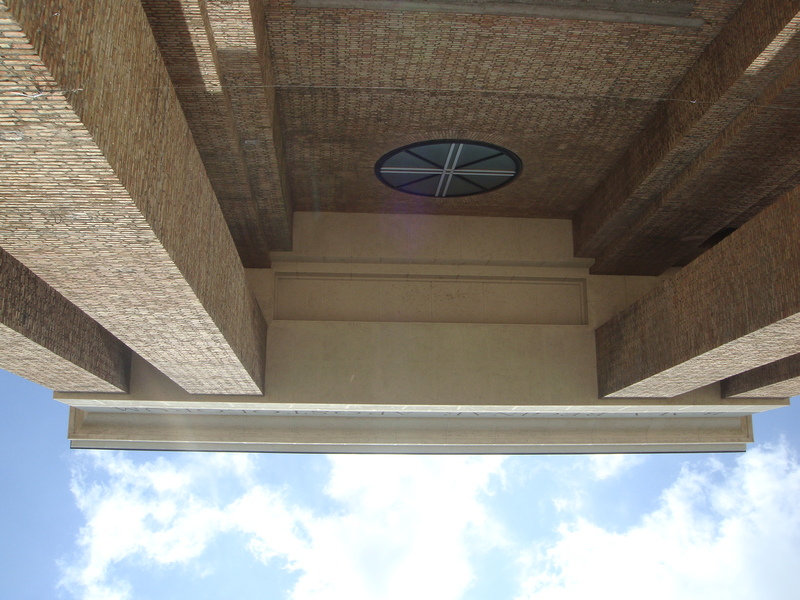 The supporting circumference of concrete is in places, 20 ft. thick. It is actually not one continuous mass but instead eight separate piers with weight relieving arches. 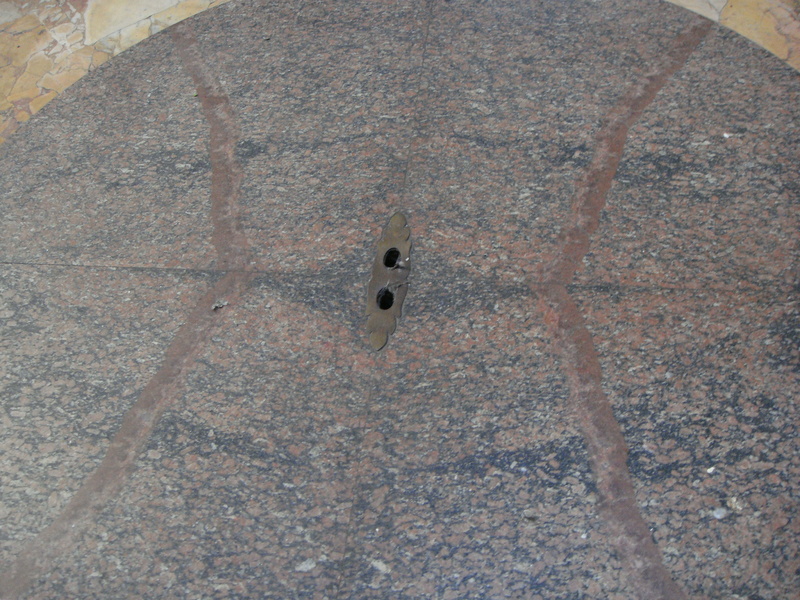 The sixteen columns supporting the portico are monolithic Egyptian granite, meaning they are each made of one. Piece. of. Stone. It appears bare because all of it’s valuable ornament has been stolen and repurposed into other structures. 60 years after it’s Christening, the gilded bronze in the dome was removed, not to be redone (without gilding) for 700 years. Bernini used bronze beams originally from the Pantheon’s portico to create the Baldiccino in St. Peter’s Cathedral. 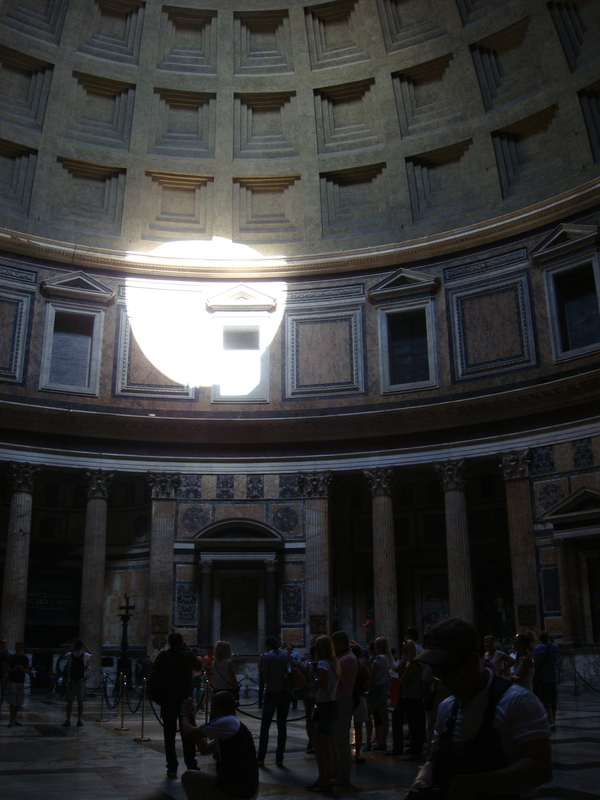 The Pantheon also uses materials pilfered from other churches. 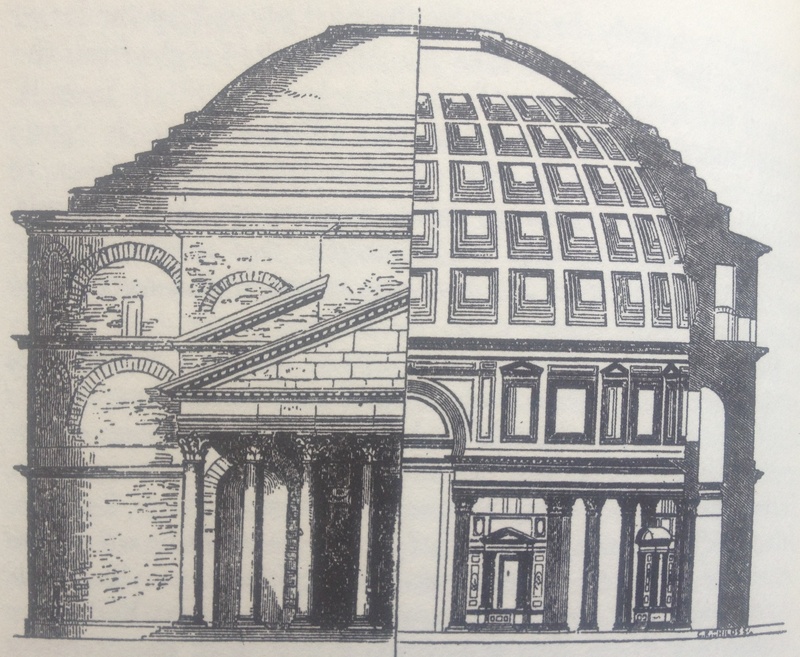 When it rains in the Pantheon, the water drains to the centre directly underneath the oculus to a small hole the width of my finger, but in extreme cases would likely drain to the circumference of the structure because the weight of the walls has depressed the ground they stand on over hundreds of years. Approach to the Pantheon from behind, with scale. 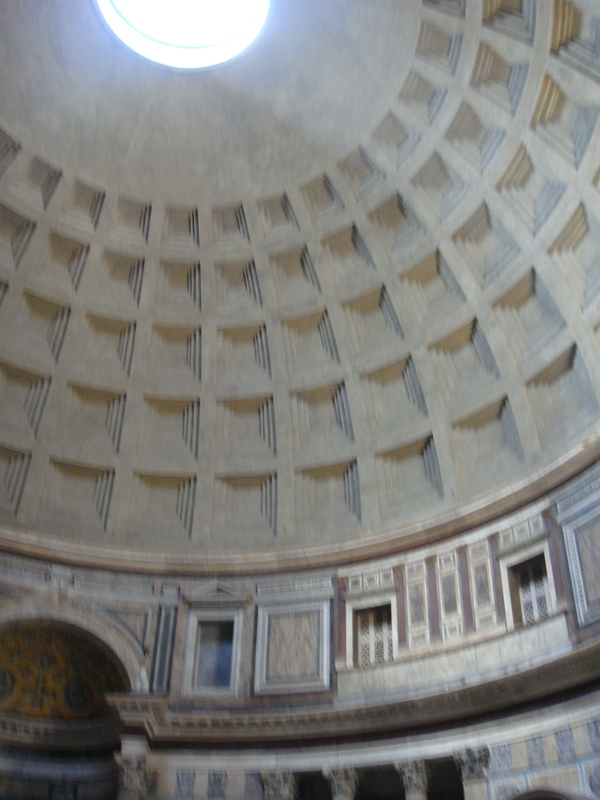 The inside of the Pantheon’s domed roof. The way the light moves.